Canyon Lake, Texas is centrally located in the Texas Hill Country between Austin and San Antonio, just minutes from New Braunfels and Gruene. On the rim of the beautiful Texas Hill Country, Canyon Lake has a shoreline of 80 miles and is fed by the cool, gentle waters of the Guadalupe River. The 125-foot-deep, man-made lake – considered one of the most scenic in Texas – welcomes the Upper Guadalupe River from the west. Canyon Lake Dam provides a controlled release of cool waters into the Lower Guadalupe River. The most popular section of the Guadalupe River runs between Canyon Lake and New Braunfels and is lined with outfitters and all types of lodging. This scenic stretch of the Guadalupe is accessible from River Road, which crosses the Guadalupe four times. Along this route are many excellent restaurants and local hangouts. Year-round recreational activities in the Canyon Lake area include boating, fishing, golfing, tubing, jet skiing, nature walks, bird watching, hiking & biking trails, sunset cruises on the lake, and river excursions. The lake area also offers a variety of restaurants and places to shop. 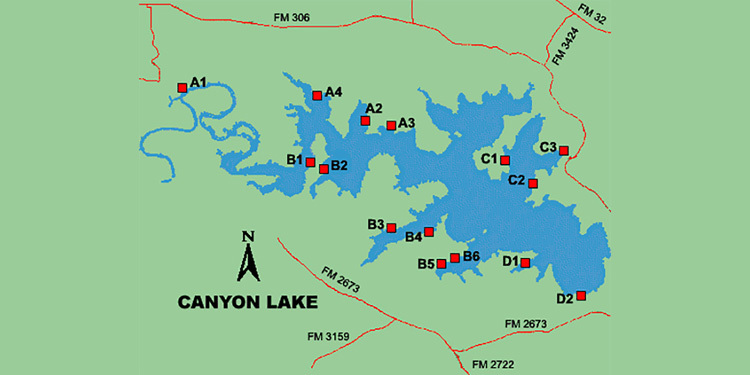 Visitors can enjoy several marinas, yacht clubs and a ski club at Canyon Lake. 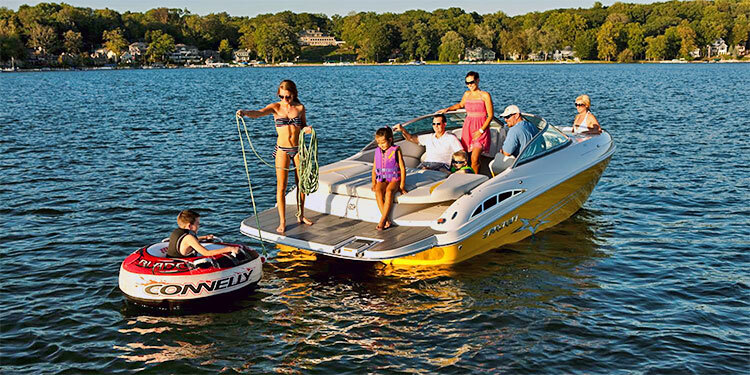 Amenities include 23 public and private boat ramps for easy access to the water. Eight U.S. Army Corps of Engineer public parks with excellent outdoor recreation opportunities are located along Canyon Lake’s 80 miles of shoreline. Largemouth bass is the most-abundant fish in Canyon Lake. Striped bass, white bass and catfish also are popular with fisher-men, women and kids. Waters are temperate enough in the summer to sustain rainbow trout. There is an annual stocking program because striped bass do not reproduce successfully in Canyon Lake. Rocky banks, rock ledges, flooded timber, and marinas provide cover for game fish in the lake. Fly fishing is popular along the Guadalupe River. Other must-sees in the area include Natural Bridge Caverns, the largest known cavern in Texas; Canyon Lake Gorge; Natural Bridge Wildlife Ranch, where adults and kids can view, photograph & feed species from all over the world from the comfort of their own cars; and the nearby Heritage Museum of the Texas Hill Country and Dinosaur Tracks. Did you know Canyon Lake has more 100-million-year-old dinosaur tracks than any other place in Texas? The Canyon Lake area also is a popular destination for Winter Texans and retirees. It’s not unusual to find “locals” who moved to the area to live and work and escape the hassle of city life. Many Houstonians enjoy second homes in the area, whose rolling hills and abundant water create scenic backdrops unrivaled in other parts of the state. RVs of Winter Texans are scattered throughout the area’s many scenic RV parks. Canyon Lake is only an hour or so away from other heritage-rich central Texas towns like New Braunfels, Wimberley, Fredericksburg, Kerrville, Johnson City, Marble Falls and Bandera.The cedar and oak woods are saturated with wildlife. Neighborhoods are shared with pet-like deer. It’s calming and natural. Photographers will be exhilarated. Enjoy local hangouts and concerts on the river.